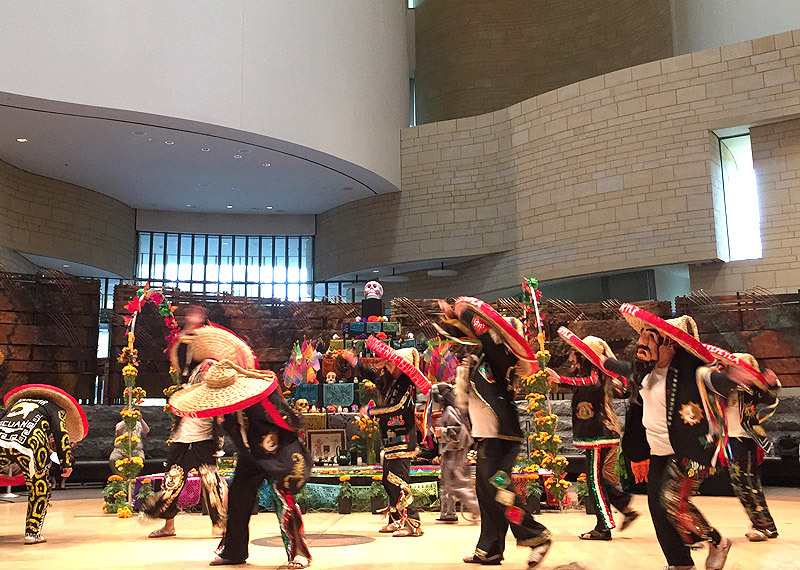 Día de los Muertos at the American Indian Museum is a fun, festive, and free celebration! Break in the costumes and prep for Halloween coming on Wednesday all weekend long! There’s a scary amount of events and activities that celebrate the spooky spirit. Some are detailed below, and this post has details on even more happenings where the tricks and treats are going on. Gather the family together for a fun evening! Children can dress in their favorite costume, participate in a garden costume parade, paint a pumpkin, try a pumpkin treat, and top the evening off listening to award-winning storyteller Gary Lloyd present “Pumpkin Tales for the Young” telling tales more funny than scary. Space is limited. Register children ages 3–12, parents are free. Join the NGA for the world’s largest drawing festival. This museum-wide celebration of drawing includes a Sketching Lab, in-gallery sessions with teaching artists, live models, music, and film. Be sure to check the website for the schedule of workshops, which are all first-come, first-served, here. The end of October and beginning of November marks the end of the long southward migration of large numbers of monarch butterflies. The butterflies’ arrival in Mexico coincides with the observance of Día de los Muertos. The museum is celebrating monarch butterflies through the creation of an interactive mural with Joaquin Newman, butterfly luminaria, and butterfly masks. Butterflies will also appear in a contemporary ofrenda celebrating the marigold paddler, an ancient Maya story interpreted by Evelyn Orantes and traditional ofrendas by Oaxacan-born Lucina Flores and Puebla-born Luz Maria Reyes. Grupo los Tecuanes shares cultural performances of Danza de los Tecuanes (Dance of the Jaguar) and Danza de los Viejitos (Dance of the Old Men). Suburban Nursey School is hosting its annual Truck Touch, this time with a Halloween twis — the first 200 kids to arrive in costume will get a treat! But everyone who attends will enjoy the hands-on event for kids of all ages.The parking lot will be full of emergency vehicles, construction trucks, school buses, and other cool things that go, and kids are allowed and encouraged to explore. There will also be a used toy and book sale, bounce houses, pumpkin decorating, face painting, nail art, little tykes ride-ons, matchbox car races, and much more! Bring your little ghosts and goblins to the Old Town Boutique District’s annual event to start their trick-or-treating early. Stop by the dozens of shops, where they’ll be dishing out treats and some maybe some family-friendly tricks. Halloween costumes are encouraged. Celebrate Día de los Muertos (Day of the Dead) with the Smithsonian American Art Museum! Enjoy Mexican folk dance performances throughout the day and leave your handmade “ofrendas” (offerings) including paper marigolds, calaveras (skull masks), and paper monarch butterflies on our Day of the Dead altar. See more about the museum here. This fun, family-friendly event created to share the joy of horses with the local D.C. community and teach kids and their families about horses and equestrian sport. Children can participate in more than a dozen hands-on educational and fun activities, including pony rides, the Discovery Communications Horseless Horse Show, the Horse Stars Hall of Fame interactive exhibit, coloring station, face painting, pony brushing lessons from Rokeby Farm Stables, plus giveaways from Georgetown Cupcake. Klinger, the famous horse from the U.S. Army Caisson Platoon, often attends as a special guest to greet the children. There’s even a pony kissing booth with Mini Cooper, the mini pony! And note that the Horse Show will be happening all weekend! Friends of the National Arboretum and the Washington Youth Garden present the 2nd annual fall festival for the 2018 OAKtoberfest and 5k Fun Run at the Arboretum. The 5k course will showcase DC’s amazing fall foliage while winding through forests and fields- all on paved, uninterrupted paths. Stay the rest of the afternoon for a children’s tree climb, a kids’ bike rodeo, walking and bicycle tours, food trucks, and live music! * Hansel & Gretel is the Main Stage production at The Puppet Co.
* Little ones will love Imaginary Friends, this week’s featured Tiny Tots show at the puppet theatre. Join Headfirst Camps this Halloween for a spooky afternoon of music, games, food, and fun at the first ever Pumpkin Rock N’ Roll! Warner Circle Park will be transformed into a full-blown Halloween extravaganza. Kids can participate in a fun costume contest and parade, and enjoy family-friendly attractions including festival-style musical performances, food trucks, inflatable rides and slides, and a hay maze. Don’t miss the main event: The Pumpkin Roll, a derby race of Halloween pumpkins-turned-boxcars. It’s a safe and fun Halloween event with something for everyone! Daytime activities for families will include pumpkin decorating, arts & crafts, face painting, trick-or-treating, and a costume parade around the Park. This event for families is a great opportunity for children of all ages to learn about the Juggling the Middle Ages exhibition through hands-on activities, including juggling lessons for kids! Guests can also enjoy two live juggling performances (2:30pm & 3:30pm), arts and crafts tables, and book readings, followed by the chance to view the exhibition. Featuring more than 100 objects, Juggling the Middle Ages explores the influence of the medieval world by focusing on a single story with a long-lasting impact — Le Jongleur de Notre Dame or Our Lady’s Tumbler — following the tale from its rediscovery by scholars in the 1870s to its modern interpretations in children’s books. Light snacks and refreshments will be available. Register for free here. It’s another weekend of the series that’s essentially a passport to artistic adventures, as the 11th Annual Kids Euro Festival brings continental entertainment right to DC. More than 70 free performances all around the metro area — musicians, storytellers, dancers, and puppeteers, and more — are performing at a variety of venues around the city through November 4. See what’s on the schedule over the next few days. La la lala la la la lala la la…Celebrate the 60th anniversary of the Smurfs, characters created in 1958 by Belgian artist Peyo. Enjoy six different cartoon episodes and watch as our blue friends get into a lot of fun misadventures! Featured episodes include: “A Gift for Papa’s Day,” “Secret of Shadow Swamp,” “Lazy’s Slumber Party,” “Queen Smurfette,” “Brainy’s Smarty Part,” and “Smurfette’s Gift.” Recommended for ages 6 and up, this screening is held in partnership with Kids Euro Festival and the Belgian embassy. Approximately 72 minutes. As part of the big reopening celebration for the John Marshall Library, local favorites 123 Andrés will perform a fun concert for kids and families! Join them and be a part of this big celebration. Join the H Street restaurant on Sunday to make some jack-o-lanterns just in time for Halloween. Enjoy complimentary snacks and cider, too. I also recommend planning to have a meal while you’re there — the food is delicious! Have some Halloween fun at the eatery! Activities include a costume contest, craft station to decorate mini pumpkins, a “HOLLOW-een” taste station of pumpkin dishes and seed snacks using all parts of the pumpkin, FREE JV bowl with purchase of a regular bowl, 1/2 off fall bowl coupon for future use, and Halloween goodie bags with purchase of a JV bowl Sunday through Halloween. An annual tradition! The Concert Hall transforms into a ghostly sight when the NSO performs new and old classics to celebrate Halloween, which this year also marks the Dia de los Muertos (The Day of the Dead) with ghoulishly attired musicians. Arrive early for trick-or-treating and a special Haunted Hall Musical Instrument “Petting Zoo.” Recommended for ages 5+. The outdoor ice skating season around DC has begun! A few local rinks are welcoming skaters to glide away under the sky, and indoor rinks host public skate sessions, too. See this post with details on where you can enjoy some cool recreation. With rain in the forecast for at least part of the weekend, you’ll want to have some go-to places to hang inside. The Great Indoors post has over 100 ideas for just those kinds of adventures. * The Smithsonian has a school for little learners! Check out the many programs at Smithsonian Early Enrichment Center. * Kids in 4th and 5th grades can ski free in PA, thanks to the Pennsylvania Ski Areas Association Snowpass program! * Bon Appétit magazine just launched a column by Deb Perelman of Smitten Kitchen on yummy dishes for picky little eaters. * A Star is Born is AH-mazing — stellar performances by both Bradley Cooper and Lady Gaga. See it (KidFree) if you haven’t already! You’re welcome, Rebecca! And thank you for the nice feedback. 🙂 Have a fantastic weekend!